As the above chart shows, the yield curve has dropped 70 to 90bps for all terms since March 19. 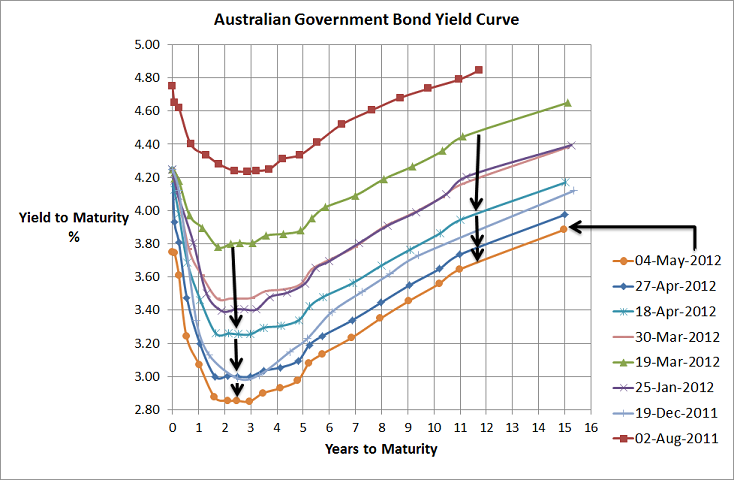 With a 3 year bond yield just above 2.80%, which is close to where it was during the worst of the GFC, its pretty obvious markets aren’t too confident in the strength of our economy or the quality of tomorrow night’s budget which is highly unlikely to provide a great deal of economic stimulus. Today we saw Australian equity markets experience their biggest one day fall in 2012 on the back of European election results that have suggested upcoming uncertainty in solving European woes plus more weak US employment data late last week. With continued weakness everywhere, fiscal austerity is not working and there needs to be a change of approach. The investing environment continues to be very very tough. Interest rates in Australia are very low and equity market volatility has made an appearance to remind us it is still there. Even Australians appear to have lost confidence in the residential property market as it has dropped around 10% over the past 12-18 months. With banks still hungry for capital it appears their deposits still offer the best relative value but even they’re not looking as good as they used to.